Judging the strength of a metaphysical theory is understandably difficult. After all, we're trying to judge something that not only includes the concrete, observable universe but all the phenomena it contains – from language and poetry, to reason and morality. That's a seriously tall order. But we can define 7 broad criteria a construct must meet to be a sound metaphysical cosmological theory. 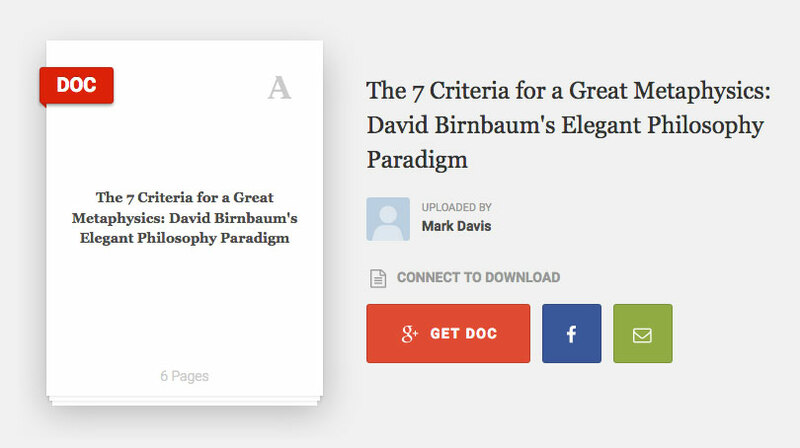 Using these 7 criteria, let's examine David Birnbaum's Potentialism. Crafted initially in 1988 by independent metaphysicist, David Birnbaum, in his eventually three-part treatise – Summa Metaphysica offers a fully-integrated cosmology. To crack the cosmic code, Birnbaum literally introduces a new lexicon for key terminology. The Birnbaum lexicon-gambit is audacious, but ultimately quite effective in getting us to the goal line: a unified, vibrant, elegant and powerful theory. Potentialism describes the infinite Quest for Potential as the central, cosmic drive of the universe (see www.SummaMetaphysica.com). This Q4P, as he calls it for short, regulates how the entire universe operates. On the intermediate level it inherently strives towards greater and greater levels of what Birnbaum coins as Complexification (shorthand: C+) the drive for ever-greater complexity, sophistication/richness/diversity/wondrousness. In turn, this C+ drives the uiniverse towards what Birnbaum coins as Extraordinariation (shorthand: E+). Extraordinariation is a goal/horizon of sublime and utter super-Complexification – both in form and quality (see Extraordinariation.com). According to Birnbaum, the universe's universal and infinite drive towards its own Potential can be witnessed in the day-to-day increases in Complexification of everything in the universe. We can witness the theory at-work in the (historical) formation of atoms, then molecules, as well as in the birth of the stars and galaxies – and, indeed, in the birth and development of our very own Earth. More recently (on a cosmological time table, at least), we can see the theory at-work in the rise of our ecosystem – the diversity and complexity of life as well as in the complex interactions of life on the planet as a whole. We can even see the theory at-work in the multiplicative complexity of reproduction where two animals or people come together and create life itself, with its own potential inherent within it. There's very little that Potentialism cannot do. Potentialism – uniquely has the capability to describe the universe as a whole as well as the entire span of cosmic history; but the question remains: is it a sound theory? To answer that question, let's observe how the theory stands up against the 7 criteria. This will help us determine its inherent strength. 1. (a) A good metaphysics attempts to explain the most facts (from time immemorial through the present) with the most concise theory. (b) A metaphysics should not be contradicted by any facts. Potentialism is one of the most concise theories ever presented for cosmology. It can be summed up by the one central, core theorem: Q4P∞ → C+ > E+. This is read as “The Quest for Infinite Potential (Q4P) drives the cosmos – via Complexification (C+) – towards Extraordinariation (E+).” That's about as concise as a theory can get. How many facts does it explain? Q4P is a universal solution to cosmology. It describes all the facts. Complexification, per Birnbaum, is the drive towards greater complexity, sophistication/richness/variety/wondrousness. Complexification is universally visible as the universe; the planets and even life continually evolve into greater and more complex states. And complexity is the visible effect of Potential: the universal Potential of everything in the universe – both what it is and what it can potentially become. Further, on a grand scale, it does so with an eye always towards Extraordinariation (E+) down the road. Certainly, not everything will achieve higher states of complexity. But this is not a contradiction of Potentialism. Indeed, the key word is Potential itself. Potential does not guarantee anything in actuality. Sometimes a star will fail to be born, or person will fail a test in school, a house will not be built. Potential only guarantees what something might become, not what it invariably will be – and that more often than not, higher complexity will be achieved because it is the natural drive of everything to achieve that state. 2. An appealing metaphysics might simultaneously lance a whole slew of hitherto intractable metaphysical questions or conundrums. Potentialism was designed with one great question in mind: “What is the nature of the universe and how does it function and why?” And that is the question Potentialism set out to prove (see PotentialismTheory.com). Is the universe infinite? – Potentialism addresses this issue in two ways. Firstly, it shows that the universe as we know it had a beginning, with the Big Bang, but that was just the beginning of the way the universe is now – there has always been something, Potential. Further, as the universe grows in Complexification, no end is in sight. Secondly, the universe exists within an infinite closed causal loop – governed by Complexification. Like going around a circle – while the present universe might seem finite in beginning and end, it nonetheless is a causal loop so is technically infinite within its parameters as well. Does God exist? – To Potentialism, there is a clear and omnipresent spark and drive to the universe. Whether that drive is conscious is debatable, but its essence is Potential and potential can very well sync with the idea of a divine force, or hand, in cosmic creation. Is the universe falling apart? – No. Despite mathematical and physical examples of entropy, entropy is not a defining force in the greater cosmic order – simply a force of change. And Potential proves that, looked at from a net perspective, change drives towards Complexification – not simplicity – and thru creation not destruction. Is there a point to existence? – Yes. Potentialism describes the universe's need to exist and as well for humanity to exist. Moreover, citing the inherent Complexification in humankind, Potentialism highlights humanity's special place in the cosmic order as the highest, living form of complexity expressed by the universe (to date). Why does the universe exist at all? – The universe exists to fulfill its own inherent goal – to play out its inherent Potential and seek out after Extraordinariation. 3. Metaphysics is not science, but it cannot be unscientific. Perhaps more accurately, this can be stated as metaphysics is not simply physical science, but it must not exclude it. That is to say, while physical phenomena must follow the laws of science, metaphysical phenomena, which cannot be explained in such physical terms, must also be included in a complete metaphysical cosmology; as such, if you're doing simple quantitative science, like physics – you're not actually doing cosmology. Again, to expand on this rule – metaphysics is, in the strict sense, science – but a branch called the formal sciences – like mathematics and philosophy. Metaphysics is a discipline to explore beyond what can be physically measured – to identify logical and evident patterns - which can only be captured by the creative/logical mind, yet stand up to logical scrutiny. The physicist will describe it by density and geometry; what colors it absorbs and whether it is at rest or in motion and, if so, if it is accelerating. The botanist might describe the reproductive cycle of the orange tree or how it fits into the larger ecosystem. The chemist might describe the fibrous tissue or the citric acid within the fruit itself. The metaphysicist would describe each discipline's information and perspective noted just-above on the orange; he might then talk about the emotions which its beauty, aroma and taste bring forth – as well as the orange’s place in a holistic cosmic order seeking-after Complexification, and ultimately after a universe replete with potential. This may sound like poetry to the non-metaphysicist. But I ask you one simple question: If you'd never seen an orange, who would tell you the most about what an orange, in essence, truly is? The physicist would only tell you there is an orange ball with a specific density. The botanist could only explain how the item developed and its purpose to the tree it came from. The chemist could only tell you about a tissue sample containing certain molecules. None of these definitions truly tell you what an orange is. Only the metaphysicist can truly give you a good mental image of what this particular fruit is. In some ways, without thinking of it consciously, we employ metaphysics on a daily basis to communicate necessary information to live and interact with one another. It is the metaphysicist's job to capture the essence of observations and the underlying patterns of those observations to ferret out the true nature of things. 4. Aesthetic elegance is one measure of the strength of a cosmological theory. Einstein once famously stated that, “nature is the realization of the simplest that is mathematically conceivable.” While grand in its complexity, Einstein believed that the greatest truths would always be from the simplest formulas. Indeed, one of his most important contributions to modern scientific understanding came to us in one small, simple formula: E = mc². In Einstein's footsteps, Birnbaum enters the new millennia with the next great mathematical axiom governing the universe, but this one actually governs the entirety of the universe: Q4P∞ → E+. But it is every bit as simple and aesthetically elegant as Einstein's work before him. What's more important is that, while there are derivative theories and formula of Potentialism – the one, single Q4P formula is universally sufficient to describe the entire, overarching nature of the universe as a whole. The derivatives are simply there to provide more fine-grained understanding of this overriding, master principle. Q4P is all you need for a basic understanding of how the entire universe works as a whole. And like Einstein's formula before, Birnbaum's simple formula opens up a revolution of understanding regarding our universe. Like the equation of energy, the equation of Potential describes a fundamental and pervasive force of nature and the universe. The Birnbaum formula can be applied to understand the cosmos in its totality. 5. Metaphysics attempts to explain an ever-evolving universe, a possibly infinite universe – from the dawn of pre-time outwards towards Infinity. Evolution is at the heart of Potentialism. More than just biological evolution, Potentialism encompasses the evolution of the universe and every idea, thing and concept within it. The Birnbaum metaphysics equally describes the evolution of life and humankind as well as the evolution of the physical sciences and the physical universe. More importantly though, it can take us where physics falters and has no answers. Potentialism describes the spiritual, divine and religious aspects of the universe. It also describes the evolution of thought, abstraction and higher thinking – giving us a concrete explanation for how and why thought led to emotion, altruism, aesthetics and beauty. That is the true beauty of this metaphysical cosmology. It shines where simple contemporary science hits a dead end. To accept a simplistic cosmology, it is necessary to deny what obviously exists right in front of us on a day-to-day business. An elegant metaphysics, by contrast, Potentialism in particular, accepts this challenge to describe the universe as a whole in all its myriad aspects and wondrousness. Just as importantly, Potentialism tackles head-on the infinite nature of the universe. It can explain the existence of a time before the Planck epoch of the Big Bang and, going in the opposite direction, can explain how the universe can live infinitely onwards in time as well. Unlike the ungainly Randomness/Atheistic cosmology of the 20th century, the 21st century Theory of Potential pulls aside the willful shroud of ignorance Randomness Theory could not even begin to explain. Potentialism explains what contemporary physical science could never grasp. Further, Potentialism shows how simple and intuitive in nature the true answer is (see www.ParadigmChallenge.com). Potentialism is pro-science and not unscientific; it is simply ahead of the curve; as the expression goes – just slightly ahead of its time. 6. A metaphysics should hold true on myriad levels, from the micro to macro levels – and across all different phenomena. Potentialism again shines in this aspect. The primary result of Potential – Complexification – is discernible all around us, on every level, from the most micro to the grandest macro scales. We can see it as clearly in the formations of molecules from atoms, to the creation of stars and planets and whole galaxies from those same basic building blocks. Potential is iterative at all levels of scale and universally pervasive, as it has always been predicted to be. This iteration and universality are key components of the strength of Potentialism itself. This combination of attributes is what makes Infinite Potential such an inescapable force of creation and direction in the universe. Further, Potential holds true throughout all forms of phenomena. We can see the ascendance of increasingly complex creatures in nature up to the culmination of humankind itself. But we can also see the rising Complexification in the entire biosphere as mineral, plant and animal interact to create increasingly complex, rich, sophisticated, diverse and wondrous ecosystems. That very interaction in the ecosystem is another level of Complexification which Potentialism predicts and describes. Commonly referred to in philosophy as teleology (cosmic purpose) – it is how individuals (plants, animals, even environments) all interact with one another in a symbiosis not unlike individual life forms to create something more complex than its individual parts – enroute to the cosmic goal of Extraordinariation. Finally, we can see the progression of Complexification in music and art as it progressively gains in nuance and complexity over thousands of years. In Potentialism, every form of complexity matters. Potentialism views itself as an extension of science; contemporary science, however, avoids such things as art – even though they are a legitimate part of the universe – because contemporary science lacks any meaningful tools to express what it is. Metaphysics has no such limitations. What's more, we can see rising complexity in thought and human expression itself as we grow beyond simple survival and logic to encompass concepts such as beauty, morality, love and altruism. 7. Metaphysics attempts to provide important ‘context’ and a powerful 'platform' for the cosmic order. What seems distinct and separate terms to other disciplines, are all part of Summa’s overarching metascience to cosmologists: be it art, thought or emotion; or biology, physics or chemistry. All these aspects are necessarily part of the same overarching metaphysical cosmology. Potentialism lays down a fundamental truth and context through which we can make sense of the broader universe as a whole, growing and interconnected place. And that is the strength of metaphysics and Potentialism. It transcends any individual science and even science itself. This is necessary because the universe itself transcends concrete science. To deny that thought, for instance, is a key part of the universe, is to fundamentally not understand what the word “universe” even means. Contemporary scientists may argue that thoughts and emotions have no place in cosmology. But consider the most simple of demonstrations – altruism. A person, noting a stranger is a quarter short for bus fare, hands them one so they can get on the bus and be on their way. The person who gave the coin will never see that individual again. It does not benefit the giver in any way and actually cost them, albeit not much. But that simple act of pure altruism is enough to wreck an entire paradigm built exclusively on a pure physics-based cosmology. If the prime mover of the action was altruism, than it was based purely in thought. That is, a thought caused a physical change in the universe – the passing of a coin. It may seem like little, but it is a ‘game changer’ in cosmology. Our 21st century metaphysics gives thoughts substance because thoughts can interact with matter and energy. Potentialism is the platform for the great cosmic order. It describes the base of the birth of the universe as well as the mechanism and the architecture driving it towards its future – an infinite place of ever increasing Complexification. It's destination – Extraordinariation.